A few days ago, I received a phone call from JustFabulous with exciting news: I have been selected to become part of their Elite program! 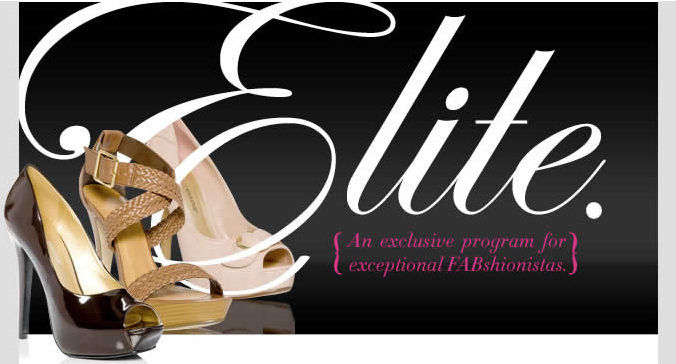 Elite members receive great perks such as receiving their boutique 24-hours in advance, a dedicated phone line, a cute watch, and premier access to just about everything JustFab. When JF first rolled out this program several months ago they had a computer randomly generate a list of members that were invited to join and test out this new program. Naturally, everyone who didn't get selected inquired about how they could become an Elite member. JustFab let us know that it was a trial period only and they would, in the future, select additional members to join. They would select these new members based on purchases, referrals, Facebook and Twitter interaction, contests and more. I definitely fit the bill for what they are looking for in an Elite member - I've made tons of purchases, referred a phenomenal amount of ladies, tag JustFab on Twitter often, and chat on and upload pictures to their Facebook page all the time. The only place I think I am lacking is in the contest area (I enter some but not all). On top of my new Elite status, I've also been invited to attend JustFab's Style Night which is an event that will be taking place on June 15th in NYC. There will be a fashion show featuring their new collection, drinks and appetizers, and more. I will be attending and of course taking pictures which I will share with you. I will possibly be meeting some of my "shoe friends" for the first time at this event which is the most exciting part about it - Lisa, Mia, Esther, Chanda, and Lori. As I've mentioned in the past, over the last 2-1/2 years I've become close friends with many of these girls. The only problem is we are all in different parts of the country so we have never met. Luckily, JustFabulous is hosting a style contest in which three grand prize winners will win a trip to NYC and get to attend the event! I am hoping, wishing, and praying that three of these ladies are the winners. I would love to get a chance to finally hang out with them. On that note, please take a second to vote for Mia! << This link will take you to her entry on Facebook where you simply click "VOTE NOW" next to her photo to cast your vote. Please help bring her to NYC!!! It took me a little convincing to get Mia to enter the contest, so I wanted to show my full support and promote her entry! I truly appreciate all of you who take a second of your time to vote - as does Mia! Thank you, thank you! For more information and to enter please see my giveaway post: It's Giveaway Time! Contest closes Wednesday, 06.01.11 at 11:59pm EST.